Brain lobes (https://www.flickr.com/photos/125992663@N02/14599057004) by Allan Ajifo (https://www.flickr.com/photos/125992663@N02/) is used under a CC-BY 2.0 license (https://creativecommons.org/licenses/by/2.0/). 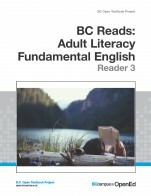 BC Reads: Adult Literacy Fundamental English - Course Pack 5 by Shantel Ivits, Vancouver Community College is licensed under a Creative Commons Attribution 4.0 International License, except where otherwise noted. including pre-reading questions that can be used for individual reflection, journaling, or class discussion, vocabulary-building exercises, comprehension questions, spelling lists and exercises, grammar lessons and exercises, and writing tasks. 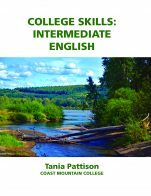 There isn't a glossary at the beginning of the entire text, but each chapter has a list of the skills/goals that can easily be accessed to determine what chapter to work on or what skills to review. further developed with accompanying materials by an instructor, if a student is really struggling with a writing or reading challenge. ourselves to reach our goals." It accomplishes this, providing stories, reading, writing and grammar activities that are based in real life, following narratives found in psychology, science, religion and other practices of self. It is never didactic, but exploratory, and provides both student and instructor with plenty of interesting tidbits brain and psychological science, and how you can tap into healthy and transformative practices. The content of the course-pack, the exercises, is accurate, error free and unbiased. The activities are many, and the graphic organizers assist in the planning and development of writing for the student. Unless the ALF Level 5 outcomes change suddenly, the content will remain applicable for a long while to come. 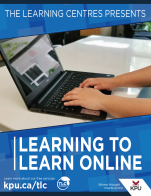 Additionally, the online component moves towards computer literacy skills becoming a more integral part of the ALFE L5 articulated goals. New vocabulary words are well introduced and opportunities are given to review and use them in new contexts. The text strikes a nice balance between challenging vocabulary and familiar vocabulary. Nothing seems outside the ability of a L 5 student. The themes, diversity of the brain and tools for self empowerment, facilitate a wide framework for activities on science, religion, psychology and other disciplines. Particularly relevant for Adult Upgrading students may be the section on learning disabilities. The course-packs themselves follow a very structured learning process, and direct the teacher and/or learner each step of the way. The skills used in the early parts of the text are scaffolded into later parts, allowing for many opportunities to self reference, and a sense of consistency for the student. 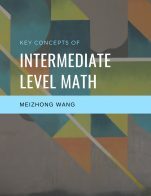 The entire L1-5 (I haven't delved into L6) has this consistency, so it's a great series for a student who may be starting from L1- and moving along through the levels. Each course-pack has a reading assigned to it, and both can operate independently of the text. Everything can be broken up, including the grammar, reading, and writing activities, into smaller separate ones. If a teacher is teaching a group class, it would be ideal to break the chapters into sections, and teach based on class needs per section. For a self paced class, a teacher can also assign one chapter at a time, and use supplemental follow up activities based on student need. Secrets of a Happy Brain. Because of the modular nature of the course-pack and readings, the chapters can be mixed around depending on instructor discretion. The organization within the text is strong, as it moves from science, active learning strategies, and psychology in a well thought out fashion. Furthermore, the exercises and activities in the first chapters are built upon in later chapters, so if you were to pick and choose different sections, you may need to review earlier chapters for directions with graphic organizers or exercises. The text is free of significant interface issues, and the font can be adjusted online through a browser. However, one less significant issue is the size of the directions in the subheadings. If they were slightly larger, students would be less likely to skip over the sections they didn't immediately understand. Generally, if all the directions were larger, I think the text would flow better. For some students, constantly referring between the readings and the course-pack can become a bit challenging. There are advantages to combining the readings with the course-packs, as well as having them separate. I prefer having the stories and course-packs together, because it is easier to access and photocopy. Separating them provides an opportunity for extended pre-reading activities. Both work. None that I was able to find. The text makes use of inclusive examples of people with learning disabilities, people who are deaf and hard of hearing, First Nations, and Western Cultural Practices. It has content and imagery relating to people of colour, caucasian people, and a picture of a Buddhist Monk. It is diverse, inclusive, and a great resource for a person from any background. This book is written from a progressive, Canadian perspective. The only suggestion I have is to change the numbering on page 82. There are moments where numbered points ( ie. 5. ) shift to alphabetized points (ie. a) and this causes some confusion for using the answer key and following directions. 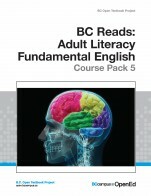 A great resource for teachers in post-secondary literacy and even k-12. Thank you!